Are you new to selection criteria and not sure if what you have written will work for you? Have you written statements to selection criteria before and not been short listed for interview? Have you written a quality statement and want to see if it can be even better? Then try the Selection Criteria Review Service. For full details, please read this brochure. This is how the service works. I do not write the statement for you. I work on the basis that you learn how to write a stronger application so you can independently apply this knowledge in the future. When you have written your statement to the selection criteria send it, along with your resume and the job details, for review. This can be arranged by phone and email. I will review what you have written and insert suggestions and comments into your documents about making your statement stronger and more convincing. It is then up to you to decide which suggestions to act on. In order to do this you will need to allow sufficient time to make the changes before the application is due. Based on past experience, it usually takes between one and two hours to complete this service. Turn-around time is usually within 24 hours. Fees vary depending on the level of the job. If you are after someone to write your responses for you, I suggest using the Find a practitioner on the Career Development Association of Australia website. You can inquire about this service by using Contact Us. Reading How to Write and Talk to Selection Criteria may mean you don’t need to use this service. 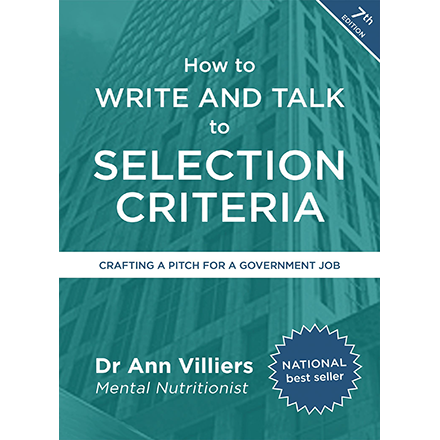 Your book “How to Write and Talk to Selection Criteria” was given to me as a gift to help me score a dream job in the Public Service. The dream job did not eventuate straight away and years passed but I found the book to be very useful, helpful, practical, and straight forward as a reference in addressing selection criteria and for going through the process of a job application. Several friends now also have copies of this book upon my recommendation. I swear by this book for any job applications! Having used the book for a job application, I still found Ann’s coaching very useful. She is resourceful, patient and an expert in her field. She has excellent knowledge of the recruitment process in the Public Service which I found very helpful for somebody wanting to break into the Public Service. Her coaching session proves to be useful for a sounding board and more importantly a way to discuss and explore certain interview scenarios. Ann also raised possible interview questions that I did not think of and was asked at the interview. She has a way of summarising your ‘racing thoughts’ before an interview and also conceptualises and simplify your thoughts for an interview. The Selection Panel noted that I was articulate and well prepared for the interview. I have now landed my dream job and it is thanks to Ann’s guidance and Mental Nutrition!